I am working on an exciting new project! From the 1920s-1950s the automat held a special significance in the landscape of America's Cities. For many members of the working class, automats were some of the only affordable dining options, with most meals costing only five to ten cents. During its heyday, there were over 40 automats in Manhattan. The point I find most interesting about automats is that they were both the beginning of automated service (thus the beginning of the end of employee-to-customer interaction), but they were also a place for social integration, as people from all social strata commonly converged there for lunch. With nobody to seat people or refuse service, everyone who entered was on equal social footing. In this way, automats became de-facto community gathering spaces, as groups could meet and loiter there all day without fear of being tossed out, even if they did not purchase items. In my research I discovered that automats were seen as havens for members of gay and lesbian communities to gather. Some proprietors even promoted them as “gay hangouts” to bolster their late-night crowds. Automats were also places for persons of color to dine, for the most part, without discrimination. Due to the lack of person-to-person interactions required, automats were popular among immigrants and non-english speaking people. For my project, I am building a mobile “Artomat”. 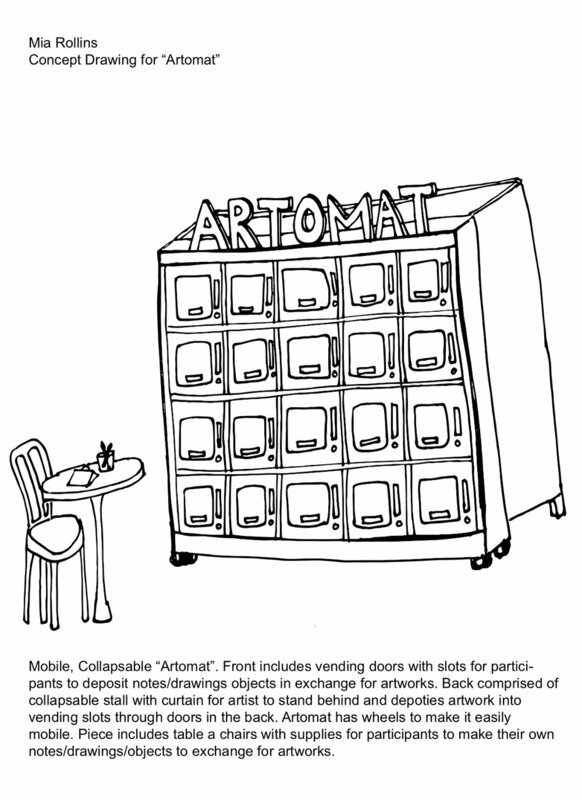 My Artomat will dispense small works of art in exchange for notes, drawings, or other small personal tokens from participants. Tables will be set up in front of the artomat with necessary supplies for members of the community to make items to exchange, and I will have volunteers on hand to explain the project to people and invite them to participate. Here is a collection of bits and pieces of info and drawings I have gathered to help flesh out the concept. Enjoy! Crappy Magic Experience at the Nashville Flea Market April 27-29th! A Silly Sort of Thing- Costumes!